We hope you’re reading the 16th annual Campus Community Book Project, pictured here with its predecssor titles. A law professor’s talk next week on “Trans Rights and Fights in the Time of Trump” is among the first programs in the 2017-18 Campus Community Book Project. 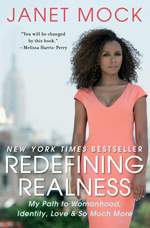 Lectures, films, an exhibition, and book club meetings and other discussions are planned through February in connection with Redefining Realness: My Path to Womanhood, Identity, Love & So Much More, by Janet Mock. Some of the events will be off-campus, including a “Gender, Youth and Activism” roundtable at Davis High School next week, in keeping with the book project’s mission to engage the wider community beyond students, staff and faculty. Most events are free and open to the public. See the book project calendar, which will be updated as new programs are added. Published in 2014, Redefining Realness relays Mock’s personal experiences growing up multiracial and transgender, offering her perspective on the challenges she faced and how she achieved acceptance and self-realization. She’ll be at UC Davis on Feb. 5 for a free forum and an evening talk at the Mondavi Center for the Performing Arts. In announcing the book selection, Dateline UC Davis quoted Janet Mock as writing: “I believe that telling our stories, first to ourselves and then to one another and the world, is a revolutionary act. It is an act that can be met with hostility, exclusion and violence. It can also lead to love, understanding, transcendence and community.” Click this box to read the Dateline story. Redefining Realness is available at UC Davis Stores for the discounted price of $10.50. The book project encourages people to not only read the book, but also participate in the many programs that have been scheduled (with more to come), from Davis to Sacramento, and, most important, discuss the book among themselves. That was the impetus for the book project in the aftermath of the 9/11 terrorist attacks, to get people talking about a book that many of us are reading at the same time, and to acknowledge that not all of our opinions will be the same, and yet we can still be respectful of one another. Now in its 16th year, the Campus Community Book Project invites nominations annually on different themes. Mock’s book emerged as the selection from among nominations on the theme of “the intersection of racial and LGBTQIA (lesbian, gay, bisexual, transgender, queer, intersex, asexual) identities.” See all the books since the first year, 2002-03. “Gender, Youth and Activism” roundtable — Presented by the Genders and Sexualities Alliances (GSAs) of Davis and moderated by Glenda Drew, professor, Department of Design; and Rocket Drew, Davis High School student. 4-6 p.m. Monday, Oct. 2, West Conference Room, Davis High School Library, 315 W. 14th St.
“Trans Rights and Fights in the Time of Trump” — Brian Soucek, acting professor and Martin Luther King Jr. Hall Research Scholar, addressing the legal landscape surrounding trans issues: so-called bathroom bills, lawsuits brought by trans students across the country, the Department of Education's rescinded guidance on trans students at federally-funded schools, and the pending ban on trans servicemen and women. Noon-1 p.m. Wednesday, Oct. 4, DeCarli Room, Memorial Union (second floor). Women’s Resources and Research Center Creative Circle — This circle inspired by the Campus Community Book Project. 3:15-5 p.m. Wednesday, Oct. 4, WRRC’s North Hall location. Feature-length documentary from 2015, about the life and campaigns of transgender elder and activist Miss Major Griffin-Gracy. 11 a.m.-1 p.m. Friday, Oct. 27, multipurpose room, Student Community Center. Presented by the University Writing Program and the Campus Community Book Project. Major! is the first of several films to be screened in the 2017-18 Campus Community Book Project. The calendar also lists Afuera, Kumu Hina, Real Boy, Pariah and Tangerine. See individual listings. The Blaisdell Medical Library on the Sacramento campus will present an exhibit, “Advancing Health Education, Advocacy and Social Well-Being in Queer Populations,” Oct. 1-31, in celebration of UC Davis Health LGBTQ+ History Month. The Interprofessional Book Club at the Betty Irene Moore School of Nursing will devote four meetings to Redefining Realness, noon to 1 p.m. Fridays, Oct. 6, Nov. 17, Dec. 1 and Jan. 19, in 1204 Education Building on the Sacramento campus. Beyond the Book Club, a student organization, will discuss Redefining Realness at a meeting scheduled from 6 to 7:30 p.m. Wednesday, Nov. 8, Garrison Room, Memorial Union (second floor). The Women’s Resources and Research Center will launch its new book club with two discussions of Redefining Realness, 5:30 to 7:30 p.m. Wednesdays, Jan. 10 and 24, in the Joy Fergoda Library at the WRRC in North Hall. The Forum @ MC — Panel discussion, 4-5 p.m., Jackson Hall, Mondavi Center for the Performing Arts. Free and open to the public. Evening talk: Redefining Realness: My Path to Womanhood, Identity, Love & So Much More — 8-9:30 pm, Jackson Hall, Mondavi Center for the Performing Arts. Tickets are available from the Mondavi center box office. The evening program will include a question-and-answer session moderated by Scott Syphax, president of Syphax Strategic Solutions, and the host and co-executive producer of Studio Sacramento on Sacramento's PBS affiliate, KVIE.